A Matter of Memories: :SALES: Free Shipping OR $5 OFF at Scrapbook.com...TODAY ONLY! :SALES: Free Shipping OR $5 OFF at Scrapbook.com...TODAY ONLY! 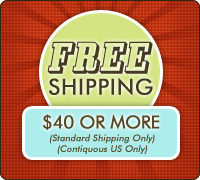 Place any order $40 or more at Scrapbook.com TODAY and get FREE SHIPPING! Enter coupon code FRSHTW4926 in the coupon field at checkout and your shipping will be automatically deducted from your order of $40 or more. OR take $5 off any $40 order regardless of geographic location! Enter coupon code SFNT2785 in the coupon field at checkout and $5 will be automatically deducted from your order of $40 or more. Coupon offers are valid on December 5th, 2010 until midnight, PST.